It’s that time of year again! I’m busy writing my annual report at work, so it’s a good time to write down What I Did in SF/F in 2014, too. For Michael and I, the biggest accomplishment this year was all of us surviving Caitlin’s spinal surgery. Period. That said, here are the things I made in 2014 that are eligible for awards. If you liked them, I appreciate your consideration. In 2014, Michael and I launched a new short fiction market, and I participated in a podcast. Both of these activities are eligible for Hugo Awards (but not Nebula Awards), so I’ve listed the relevant categories. The short stories listed below are also eligible for Nebula Awards, and you can find a copy of them in the area of the SFWA Forums dedicated to that purpose if you are so inclined. 1. 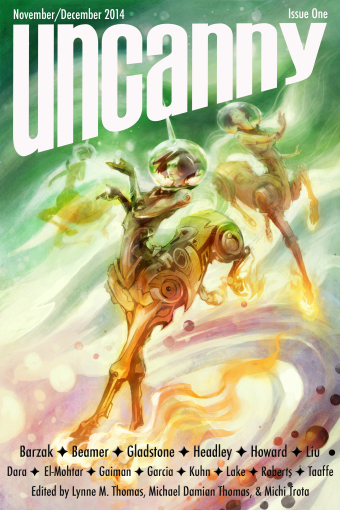 Uncanny Magazine! Issue One launched in November 2014 after a successful Kickstarter in August (THANK YOU), which means that the stories in it are eligible for 2014 ballots, although the magazine itself doesn’t meet any eligibility requirements for nominations that I know of until we complete some additional issues. We also publish poetry that is eligible for the Rhysling Awards, and nonfiction that may be eligible for Best Fan Writer. Thanks to my previous work and Uncanny Issue One, I also once again meet eligibility requirements for the Best Editor, Short Form category of the Hugo Awards. I also did some podcasting this year! The Verity! Podcast (which was also nominated for Best Fancast) had an awesome year, and I encourage you to check it out if you are so inclined. This entry was posted in awards, shameless promotion, Uncanny, Verity! and tagged awards, Shameless Promotion, Uncanny, Verity!. Bookmark the permalink.